•	Don’t leave wine glasses at snout or tail level. When pets ingest alcohol, they often experience severe drops in body temperature, blood pressure and blood sugar, which can all lead to death if treatment is delayed. Overactive tails could also knock over glasses and broken glass can easily cause injuries. •	Turkey is high in fat, and because of this, even small amounts can trigger pancreatitis. Pancreatitis has potentially fatal side effects like dehydration and liver and kidney damage. Small turkey bones can also get lodged in your pet’s gastrointestinal system and cause blockages, which typically require surgery to repair. •	You already know chocolate is dangerous for pets. But baking chocolate has even higher concentrations of caffeine and theobromine, the two substances found in chocolate that are extremely toxic to pets. If you’re using baking chocolate in your desserts this Thanksgiving, or any other chocolate for that matter, keep nosy snouts out of the kitchen! 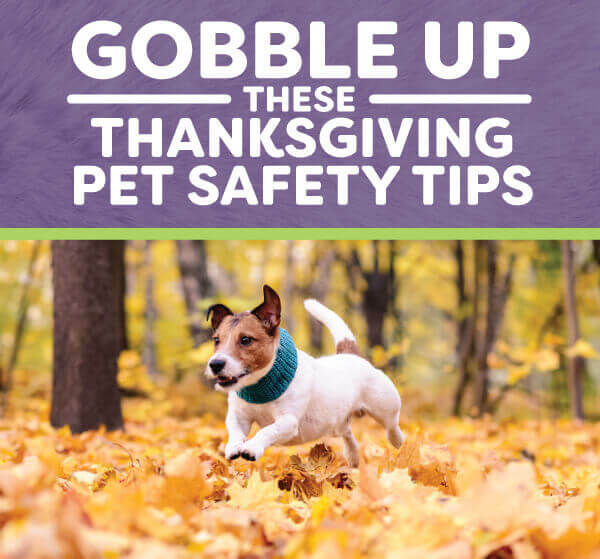 Show your pets you’re thankful for them by keeping them safe this Thanksgiving. If you need more help preparing for the holidays with your pets, call OC Veterinary Medical Center at 714-602-4713.